My daughter, Ariella, LOVED the color orange. 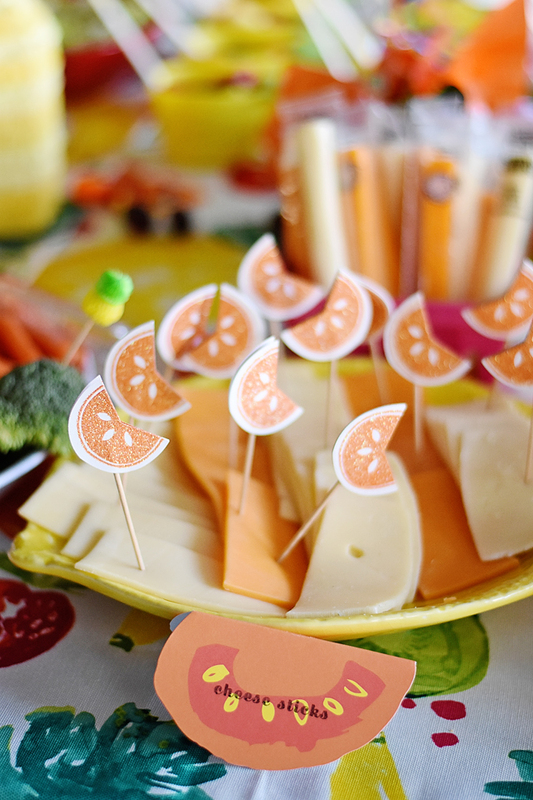 When we were deciding upon the theme for her 5th birthday party, she randomly said "Oranges!" 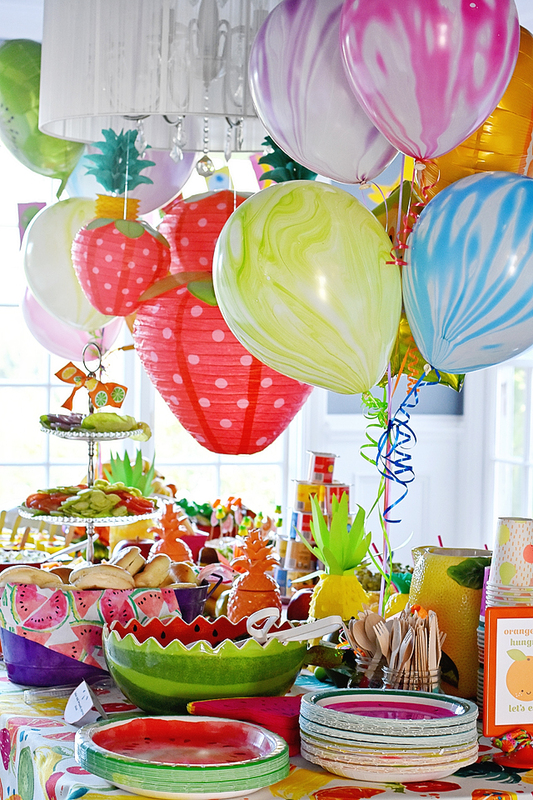 Which led us down the road of fruit, and which eventually led us to a Tutti Frutti theme for her latest birthday party. 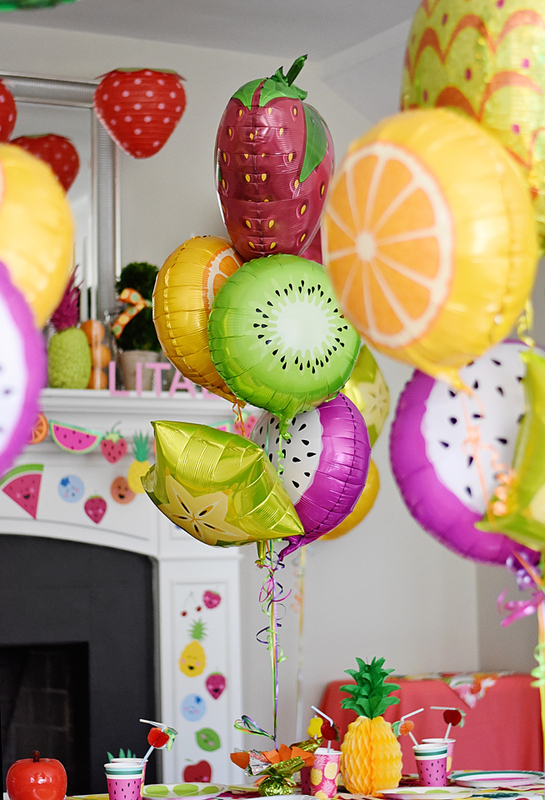 I loved this theme, the only problem is that her birthday is in January, a time of year here in which lots of fruity decorations are hard to find!! Luckily, we decided on her theme about 6 months in advance, which completely saved me! I shopped all summer long for fruit decorations, plates, pitchers, tablecloths, plates, etc. Hooray for Summer! 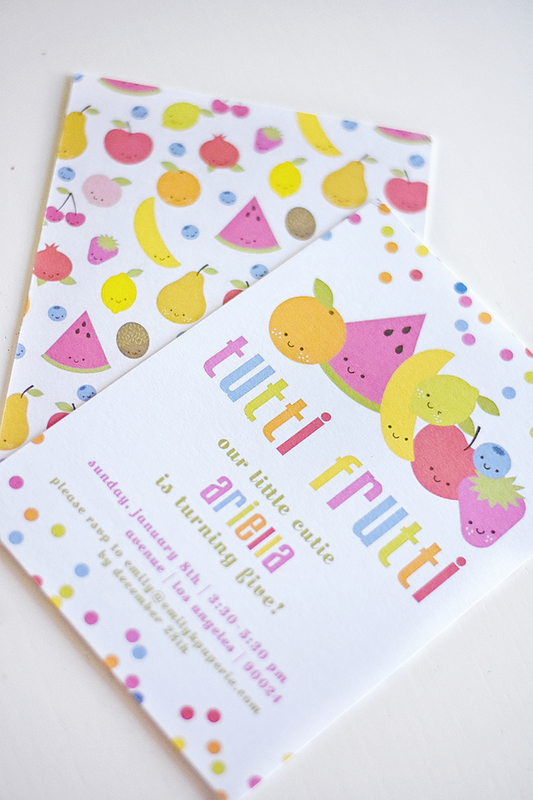 I designed the Kawaii fruit print and confetti invitations and other graphic items which are for sale in my Etsy shop, Emily Entertains. I just adore the cute little smiling Kawaii faces on these fruits. I looked high and low for vinyl wall decals of these Kawaii fruits, but I really wasn't able to find any, so I ended up using my Silhouette cutting machine and cut out a TON of fruity walls decals. This was a painstakingly slow process, as I had to layer on the leaves, stems, and faces, but I loved the look it added to the walls for the party. One of my most favorite items was the cake. Liz from Les Pop Sweets nailed the cake toppers to a "T", so to speak! I sent her a rendering I did, and she recreated it in the most amazing way!!! Another amazing element to the party decor were the glittery fruit slices that I purchased from Lula Flora. Christine made me extra ones that I put on all the chair backs of the dining chairs which added even more sparkly color to the party! I added to the fruity theme with lots of healthy and fresh fruit for the kids to munch on - pineapple fruit cups, fruit and yogurt, etc. For party favors, I did manage to find some adorable Kawaii-looking plush pineapples to give away as party favors. I put them into cardboard berry baskets with a few other items, and the kids loved them. 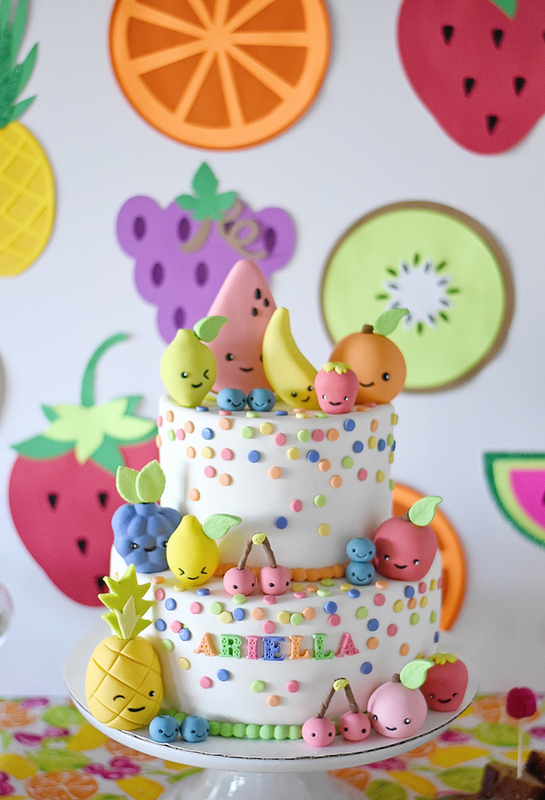 I hope you find some inspiration for your little one with this cute and colorful tutti frutti party! 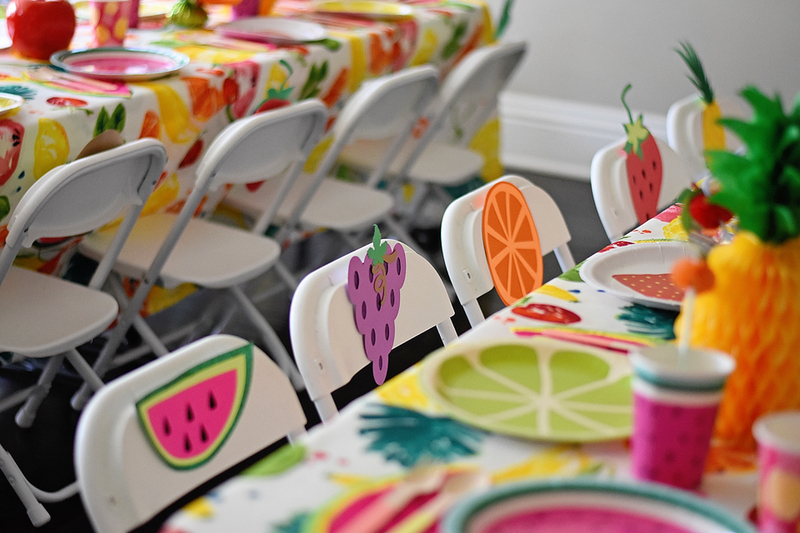 It's a great theme for kids of all ages, and makes the most colorful and bright party that the kids will love!! You always have the cutest party’s! You are so creative and have such a beautiful family.